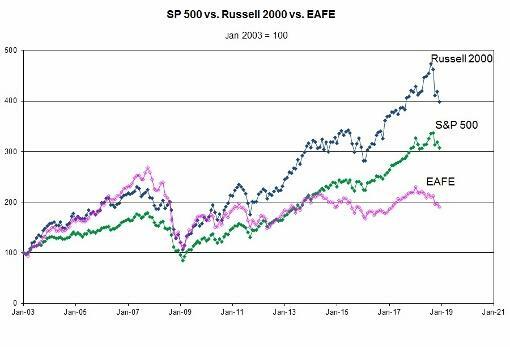 The recent sharp equity sell-off spearheaded by the unlikely combination of domestically-oriented US small-cap stocks (Russell 2000) and developed markets ex-US (EAFE) has called into question the sustainability of the Trump rally started two years ago. Divergences between different segments of the market often offer important insights into overall market dynamics. We have previously highlighted the divergence between small- and large-cap stocks as a possible sign of speculative excess and market vulnerability. (See our previous feature – Speculative Dynamics). Similarly, divergences between US and foreign equity markets in a global economy may be indicative of unsustainable trends. The catalyst for the current resurgence of risk and faltering equity markets are the administration’s randomly generated economic measures like punitive tariffs - creating doubt and confusion regarding the future. Look for the divergences in equity markets to narrow via a more sustained drop of equities generally. This article is distributed for informational purposes only. All information contained herein should not be considered as investment advice or a recommendation of any particular strategy, security, investment product or financial instrument. Information contained herein has been obtained from sources believed to be reliable, but not guaranteed.